I am spoiled. I admit it. I know full well that seeing a Nethack variant with more classes, races and skills should, by all means, thrill me quite a bit. 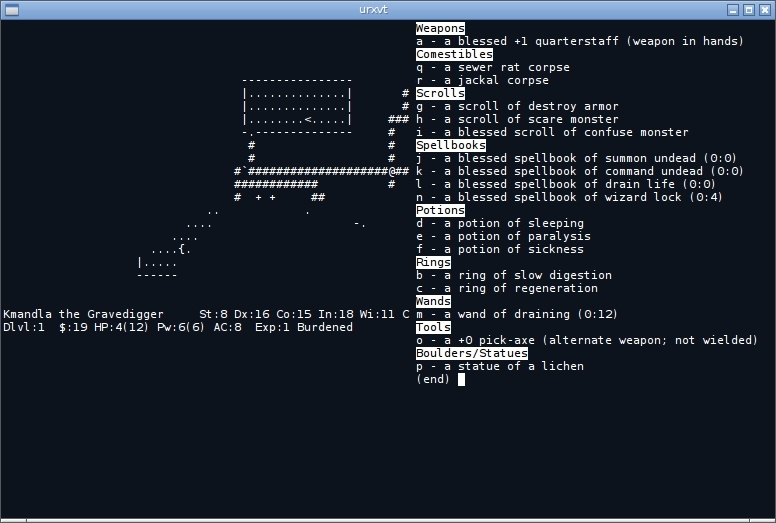 Truth be told though, seeing slash’em in action doesn’t really appeal to me any more than the original Nethack. Yes, it does have more races. And yes, it does have more classes. And skills, and specialized abilities and more monsters and more objects and shopkeepers and deeper dungeons and broader maps and … and … and toilets! slash’em is a good rebound from the classic Rogue derivative, and I am sure there are many reasons to play slash’em over the original. But the home page says slash’em evolved because Nethack hadn’t seen much attention, and now it appears the last update to slash’em was sometime in 2006. We’ve come full circle. So yes, by all means, give slash’em a try. If you enjoy the original Nethack, perhaps you’ll get a small thrill out of it. This entry was posted in Linux and tagged game on 2014/04/28 by K.Mandla. Just an FYI; Development on Slash”EM has been dead for years. You might want to have a look at Slash’EM Extended (http://nethackwiki.com/wiki/Slash'EM_Extended), instead. Same thing, but with even MORE classes, races, etc.